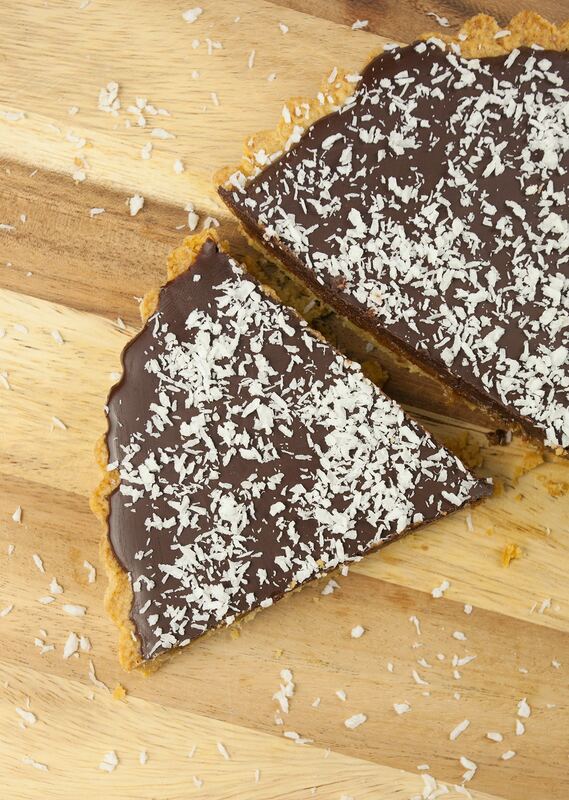 Who knew making a twix tart could be so easy? We love the simplicity of this recipe. The shortcrust base uses only three ingredients, then all that’s left is creating the layers and refrigerating the tart until everything is set. In case you’re wondering, blind baking the shortcrust using greaseproof paper and a small handful of rice will help prevent the middle of the base rising in the oven. We decided to top the tart with desiccated coconut. But you can experiment with your favourite toppings, like pistachio nuts or raspberries. Also, don’t forget to look closely at the labels when you shop for granulated sugar and dark chocolate. Not all brands are vegan-friendly. Cream the margarine and sugar together in a mixing bowl, then stir in flour and mix everything together with a spoon. Next, use your hands to bring the dough together fully. Use a rolling pin to roll out the dough into a circle on a well-floured surface. You can use the tart tin to measure if the circle is big enough. The dough should be roughly one cm larger than the tart tin. Transfer the dough to the tart tin and use fingers to push the dough against the sides of the tin. Cut off any excess dough that hangs over the tin. Prick the base of the dough 4 or 5 times with a fork and line the top with greaseproof paper. Then sprinkle a small handful of rice in the middle of the tin. This will help prevent the dough rising in the middle. Bake in a preheated oven for 50 mins, then leave to cool for ten minutes. Meanwhile, prepare the caramel layer by mixing the almond butter, maple syrup, coconut oil and vanilla in a bowl. Once the base is cool, pour the mixture into the tart tin on top of the base and refrigerate the tin while you prepare the chocolate layer. Add a little hot water to a pan over a low-to-medium heat, and melt the chocolate and coconut oil together in a heatproof bowl. Pour the chocolate layer on top of the caramel layer, making sure you cover as much of the tart as possible with dark chocolate. Don’t worry if the chocolate begins to pour over the edges. We think this looks pretty cool! Leave to cool, then pop in a refrigerator for 1 hour or until the chocolate has set. 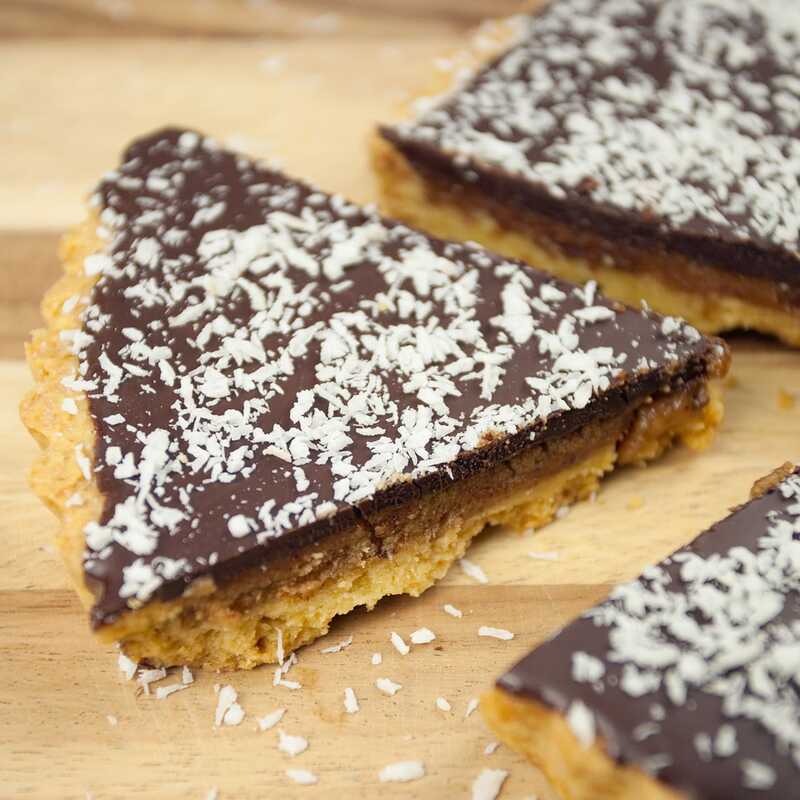 Sprinkle with desiccated coconut and cut into slices to serve. You will need a 20cm tart tin.